Alexander Ross (1783-1856) was a former schoolmaster who entered the fur trade, serving the Pacific Fur Company (1810-13), the Northwest Company (1813-21) and the Hudson's Bay Company (1821-25). Although most of his fur trade career was spent west of the Rocky Mountains, he decided to settle with his family in Red River. He became one of the settlement's most prominent and active residents, serving in most of the settlement's administrative offices at one time or another in the 1803s and 1840s. He wrote two volumes of fur trade memoirs, and a history of the Red River Settlement, from which this excerpt is taken. On pages 35-36, he describes the fatal encounter at Seven Oaks, although he does so in much less detail than the eye-witness account of John Pritchard. “The approach of the enemy was announced by the women and children of the settlers, who were seen running from place to place in alarm, seeking protection and crying out that the settlers were made prisoners. 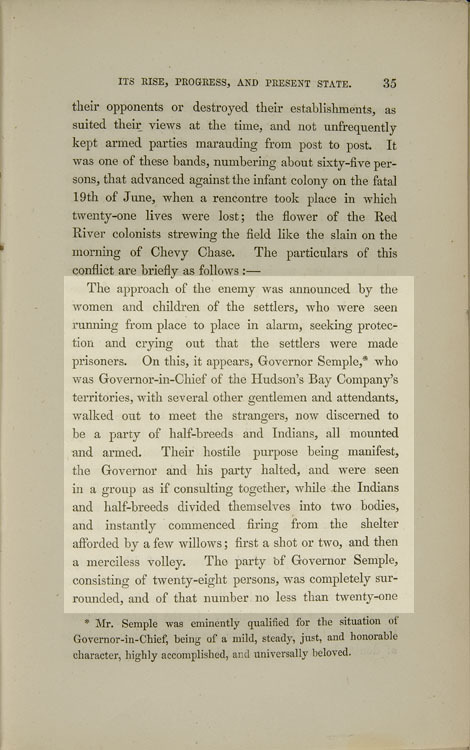 On this, it appears, Governor Semple,* who was Governor-in-Chief of the Hudson’s Bay Company’s territories, with several other gentlemen and attendants, walked out to meet the strangers, now discerned to be a party of half-breeds and Indians, all mounted and armed. Their hostile purpose being manifest, the Governor and his party halted, and were seen in a group as if consulting together, while the Indians and half-breeds divided themselves into two bodies, and instantly commenced firing from the shelter afforded by a few willows; first a shot or two, and then a merciless volley. The party of Governor Semple, consisting of twenty-eight persons, was completely surrounded, and of that number no less than twenty-one were killed: namely, Mr. Semple, the Governor; Captain Rogers, mineralogist; Mr. White, the surgeon; Mr. McLean, the principal settler; Lieutenant Holt, of the Swedish navy; Mr. Wilkinson, the Governor’s secretary, and fifteen men; besides which, Mr. J.P. Bourke, the storekeeper, of whom we shall have to speak hereafter, was wounded, but saved himself by flight. The unhallowed triumph of the murderers was complete. Only one of their number fell in the battle as they called it, and one other, we believe, was wounded, while the colonists who survived the massacre, were ordered once more to leave their homes without farther warning or preparation, on pain of being hunted down and shot like wild beasts, if they should ever appear there again. It is doubtful, indeed, whether one innocent head would have been spared; and that any escaped was due to the generosity and heroism of Mr. Grant, the chief of the hostile party, who rushed before his own people, and at the imminent peril of his life kept them at bay, and saved the remnant of the settlers from extirpation. Read more about Seven Oaks - enter 'Seven Oaks' in the search box to your left. What does Cuthbert Grant look like? What does Alexander Ross look like? What does Governor Semple look like? Check the Beaver Index - type in Grant, Ross, Semple, Seven Oaks, etc. Read more about Grant in the Dictionary of Canadian Biography Online. Read more about Ross in the Dictionary of Canadian Biography Online. Read more about Semple in the Dictionary of Canadian Biography Online. Alexander Ross established a sort of dynasty in Red River: although he himself had retired from public life by 1851, he was succeeded in several of his former offices by his half-Okanagan sons William and James.